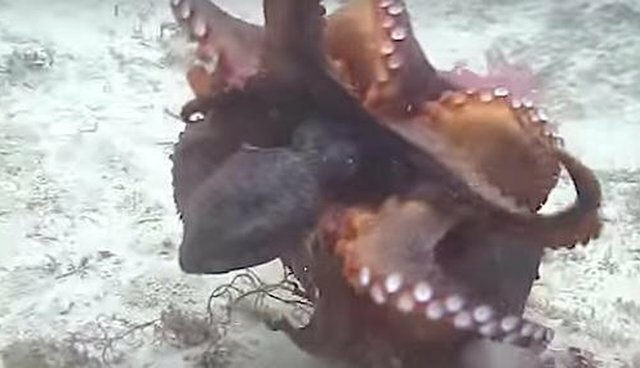 Scientists are amazed at the grumpy lengths octopuses will go to for some personal space. While researching octopus behavior, experts have been quite surprised at their findings: like octopuses fighting and even throwing shells at each other. "In general, projectile use is pretty rare among animals," Peter Godfrey-Smith, a marine biologist at the City University of New York, told NPR. A particular kind of octopus in Australia, called, appropriately, the gloomy octopus, has been exhibiting more unkind behaviors toward his own species, including hurling sea dirt at them. Octopuses have been shown to be highly intelligent, an attribute humans love to tout as their own. As philosopher Jean-Paul Sartre famously once said, "Hell is other people." In this case, it's other cephalopods. Read about another quirky octopus habit here.